This wepage is for my computer science 1 class. I'm learning C#. 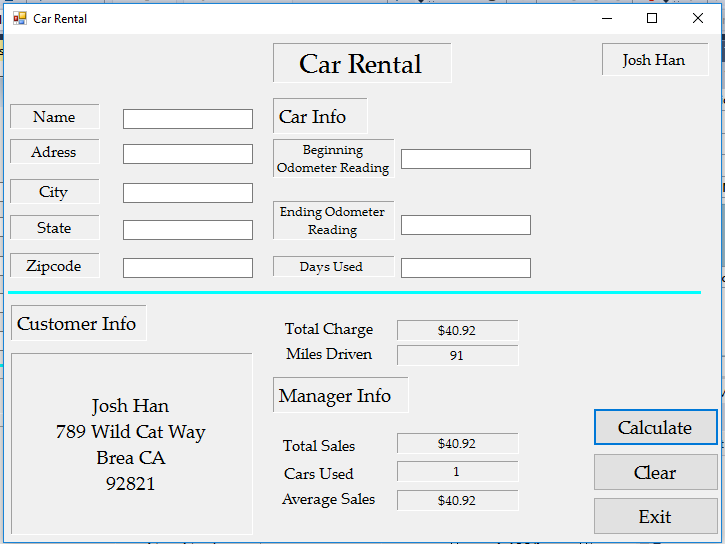 C# is for making Windows apps. 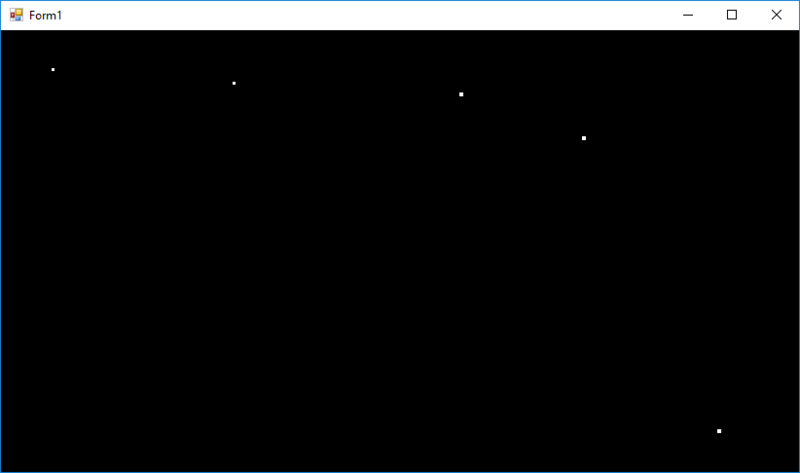 I'm not great at programming yet but I'm learning. I want to become great at coding so I can use it in my major in college. 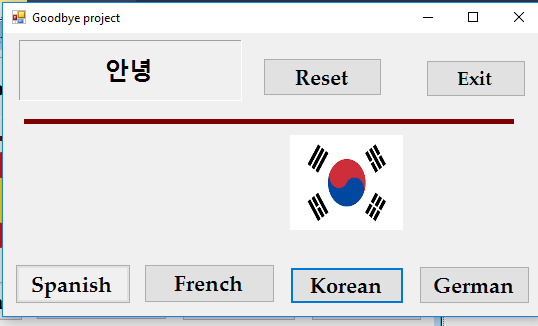 This project says goodbye in four different languages, including English. This project is a help page for my made up business, called Eye of the Storm Inc. 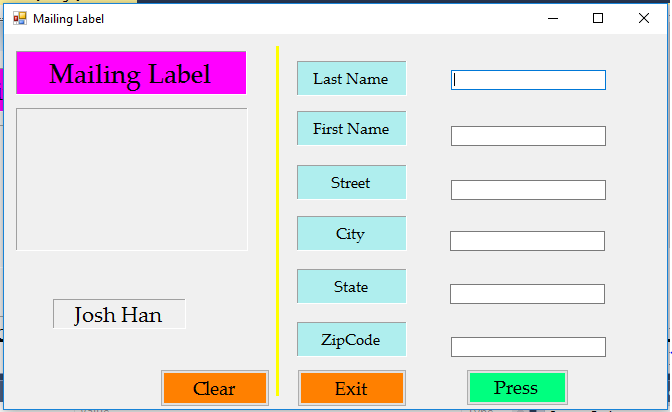 This project puts the customer's information into a mailing label. 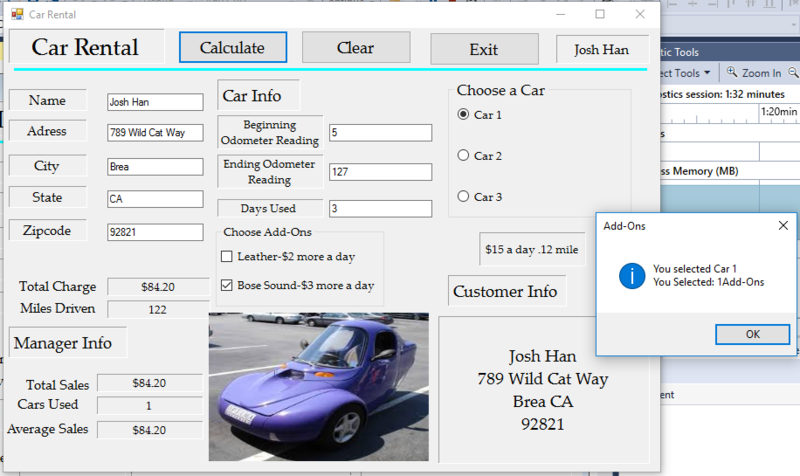 This project allows the customer to choose between 3 different cars, each with different costs. 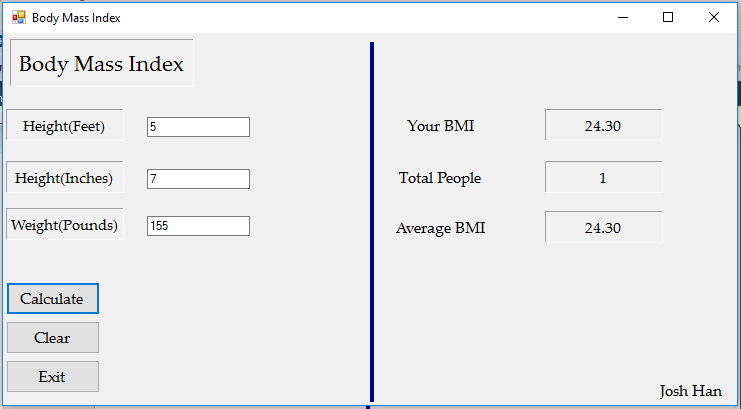 This project inputs someone's weight and height, and outputs their body mass index. This project makes a car rental page where you choose a car and it calculates how many miles you drove and how much you have to pay. You can also choose add ons like leather seating and a bose sound system. This project can take 2 test scores and find the letter grades of them. 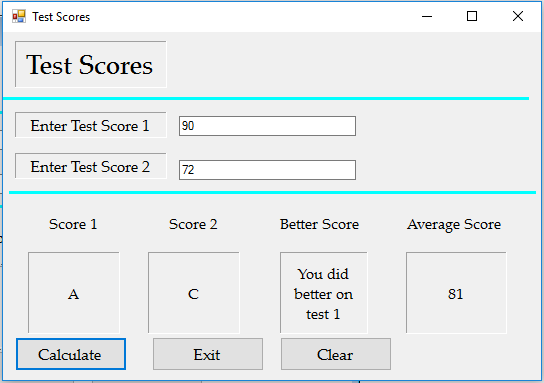 It should also find the better score and the average of the 2 scores. 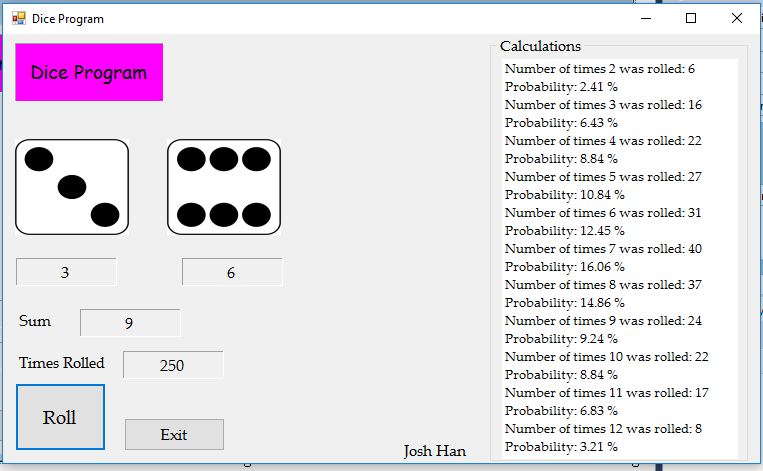 When you push the roll button, 2 random numbers and corresponding dice pictures should appear. The sums of the numbers should be kept and how many times each sum is rolled. 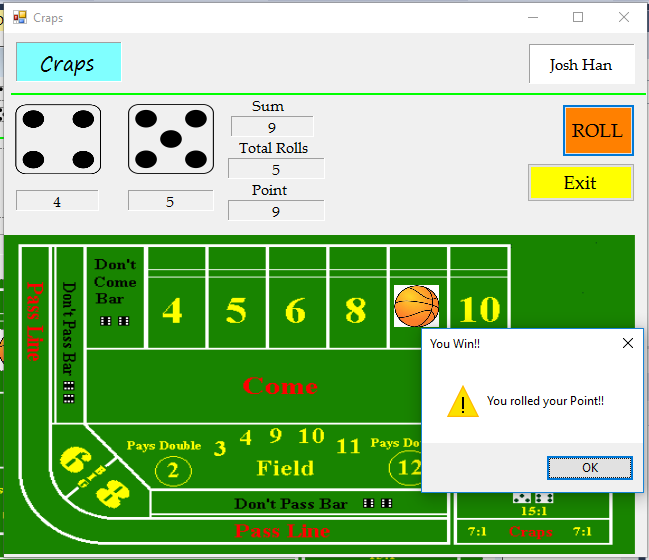 This project calculates random numbers to simulate a game of craps. 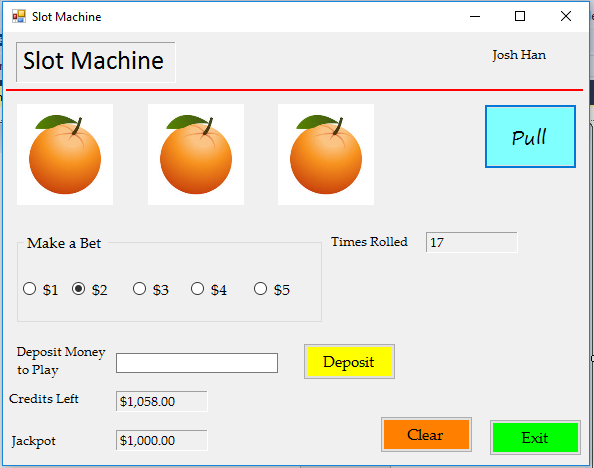 This project creates a slot machine that you can make a bet and win if you roll 3 in a row. If you win, you win a jackpot. 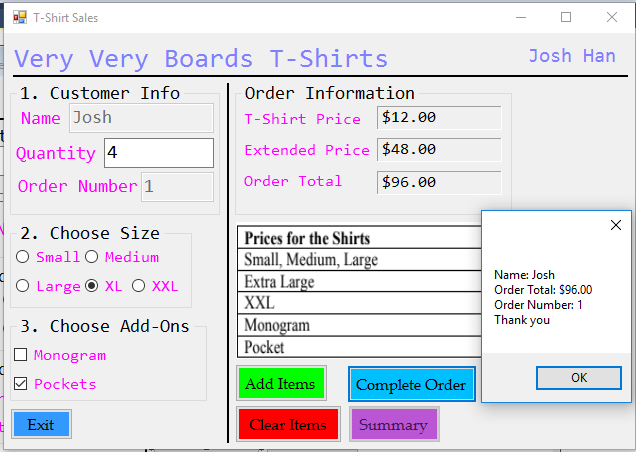 This project allows you to choose multiple t-Shirts in 1 order. Different sizes have different prices. 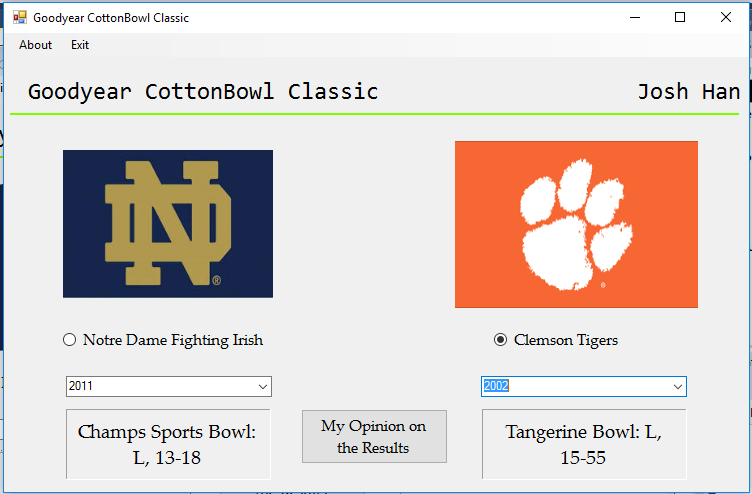 This project shows 2 football teams that will play in a bowl, and the history of school's past bowl games appear. 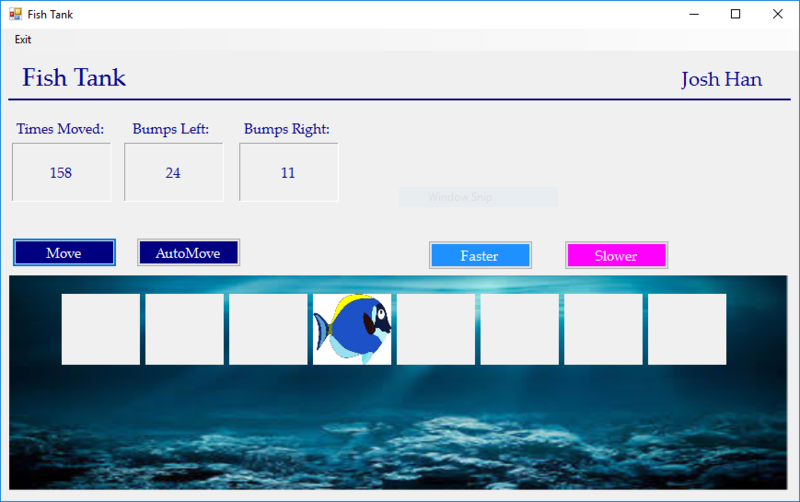 This project moves a fish left and right in a tank, and keeps track of how many times it moves. It should also stay in place when it hits the side of the tank. 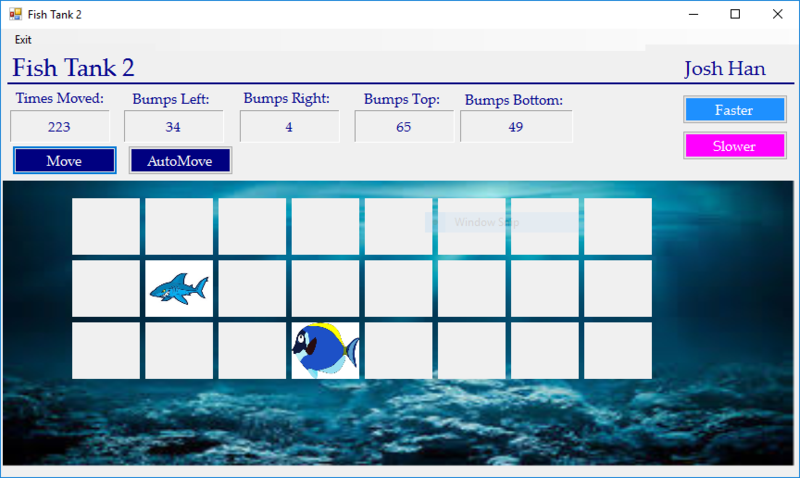 This project moves a fish left, right, up and down in a tank, and keeps track of how many times it moves. There is a shark that chases the fish, and if they are in the same spot, the shark eats the fish.It should also stay in place when it hits the side of the tank. 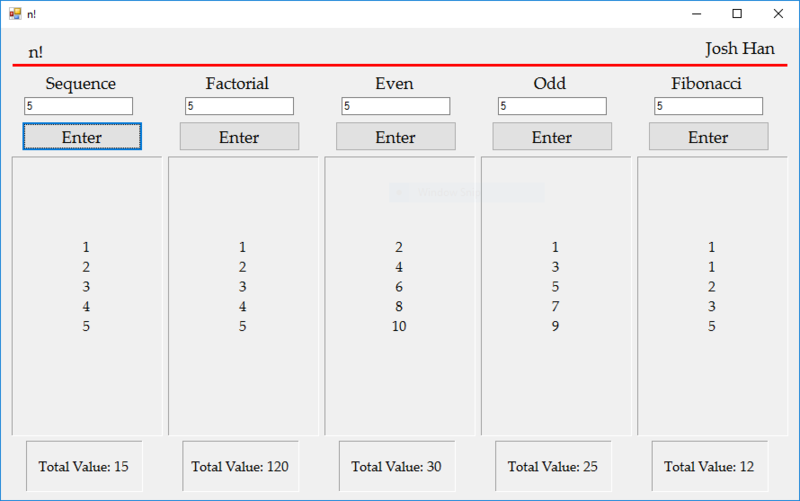 This project outputs a sequence of numbers and their sums, a sequence of numbers that has the total as a factorial, a sequence of even and odd numbers, and a fibonacci sequence. 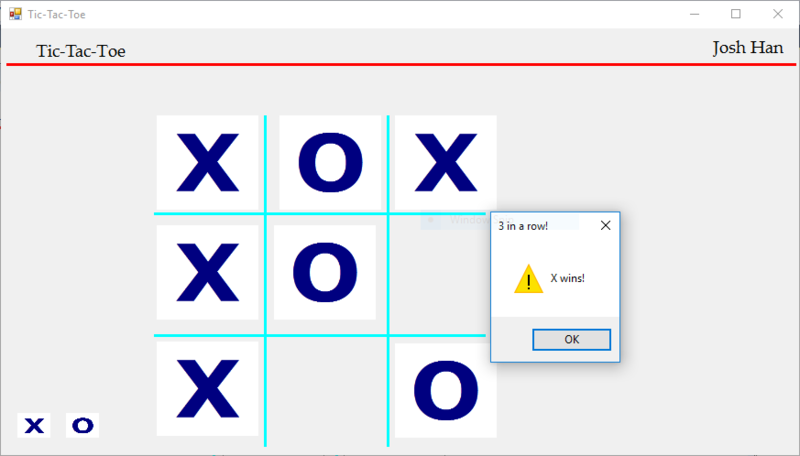 This project simulates a game of tic tac toe with no AI's. X and O can win. This project simulates a game where an AI chases a character you are controlling with the arrow keys. The good guy shoots bullets and both people have health. This project has stars moving around you and makes it seem like you are flying through space. 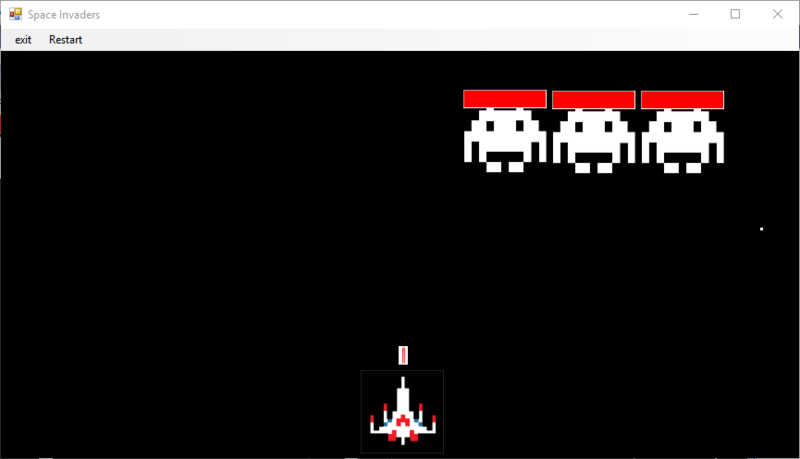 This project simulates a space invaders game with three invaders and spaceship. 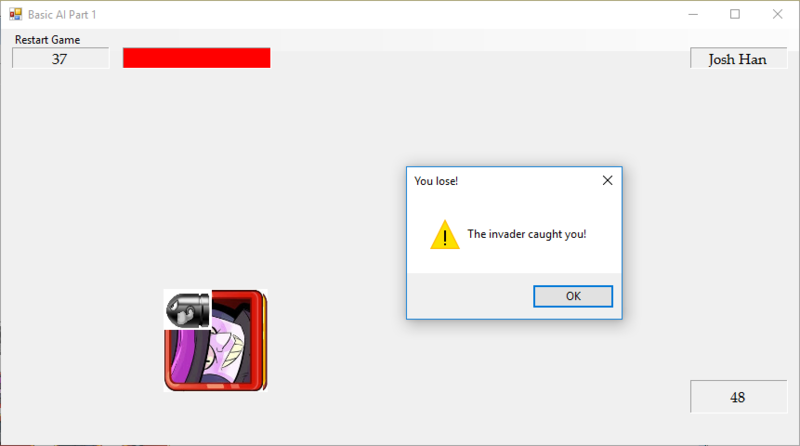 The invaders progressively move down and the spaceship fires a bullet to kill them.